Check out this video with Debra as she describes what is included as part of your wonderful tour. Click the arrow to start. It’s most impressive on Full Screen. This is truly going to be the trip of a lifetime. We will be going to all the spectacular must see-places in Egypt like the Pyramids, the Sphinx, Karnak, Luxor, and Abu Simbel. But we also go to some amazing places where the typical tourist doesn’t often go such as the Osirion at the Temple of Abydos, the Isis Temple at Philae and the Hathor Temple at Dendera. One of the things that always makes our trips special is that we do ceremony and rituals in the temples and tombs including 2 hours of private time just for our group inside the Great Pyramid. This adds such an incredible depth to the experience. All of our accommodations on the 2 week trip are five star. In Cairo, we’ll be staying at the fabulous Mena House Hotel, which is just next to the pyramids and if you like, you can have a pyramid view from your room. We also take a luxurious a 5-day cruise down the Nile on a fabulous 5-star ship, stopping at different temples along the way. 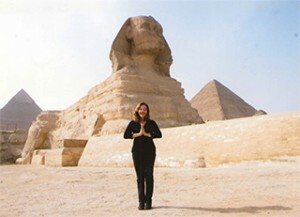 So if you are drawn to the magic of Egypt, this is a wonderful time to come. To be there with other like minded people, adds so much. And don’t be concerned if you’re not an experienced meditator or don’t know a lot about Egypt or ritual. Everything we do is very simple and is designed primarily for you to connect in with the beautiful energy of this sacred place. That doesn’t require any special knowledge or preparation, just a desire to experience that beautiful connection and peace. And don't be concerned if you don't have someone to travel with -- our groups typically fall in love with each other within 48 hours -- that's the kind of people we attract on these fabulous journeys. And of course, this is just going to be tremendous amounts of fun. Staying at 5-star hotels, cruising down the Nile on our luxurious ship, having a massage, fabulous shopping, wonderful food – it’s the best of all worlds! So we invite you to come with us and Return to Egypt – you will find lots of additional and very specific information in the other pages in this section of our web site. CLICK HERE to place your deposit now!